It’s so easy for projects of this size to become viscous, labouring forward as if through syrup while deadlines come and go. David Barnes knows the pitfalls and plans to keep our treasured British effort out of the mire and on course for the first race of the Louis Vuitton challenger series in October 2002. Building America’s Cup boats involves a huge amount of self-regulation of the boat is to hit the water race-legal and failing to observe one of the many structural parameters defined by the IACC would mean building a completely useless boat. The lessons could be learned but to make a little time in a packed schedule, Barnes has brought in some expertise. “We’re going to use mostly UK resources but we just needed a couple of key guys who have actually built America’s Cup boats before. The two guys who are the company Composite Creations, Brandon Linton and Jason Akers. 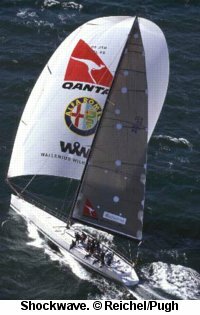 They built the Aloha boats last time, they also built Neville Crichton’s Shockwave and they were with the team that built the oneAustralia boats in ’95, (raised eyebrows all round) – they didn’t design the structures, they just built the boats. They have good experience in building America’s Cup boats, this will be boat number five for them. This creates some breathing space for the design team but they know that towards the end of this year, they must have their best possible design solution ready to be laid down before December. Then “we’ll launch sometime hopefully in April and sail the boat here for two weeks to make sure everything works because if there’s something we have to change, it’s better to do it on site. Then we’ll ship the boat to New Zealand and we plan to sail in New Zealand by June 2002. “If you consider that you’ve got June, and you can kiss goodbye to most of June because we’ve got to get the boat there, get organised, all set up. Then you’ve got July, August, September, then October – month number four – you’re racing. There’s huge confidence and enthusiasm throughout the GBR Challenge camp at the moment and provided Barnes can convert that usefully and keep everyone pitching hard at their individual targets, there’s every reason to expect that our Cup challenge will be as formidable as possible after a 15-year hiatus.